The third Saturday in September is National Pool Closing Day. However, here in the Southeast, we have several more weeks of warm temperatures, at least. 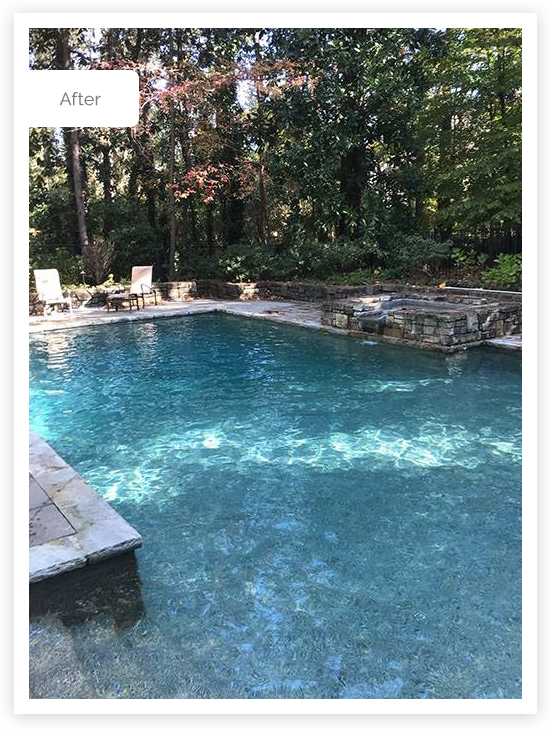 However, as the leaves begin to fall and the temperature begins to drop, it’s time to start thinking about what you’ll do with your pool over the winter. Unlike in colder climates, winterizing is not a necessity. But if you won’t be using your pool for 3-6 months, winterizing your pool can give you a well-deserved vacation from pool maintenance. So let’s take a look at winterizing your pool, with an eye towards what is required for a slightly less wintry winter. Winterizing is the process of getting your pool ready to hunker down over the winter and get by without any maintenance. Normally, if you left your pool unmaintained for even a week or so during swimming season, you’d be in for trouble. Algae and debris would clog your pool. You could even end up with the dreaded “green pool” that can require days or weeks to recover from. But when you winterize your pool, you are preparing to go for months without any maintenance. It may sound like a fantasy, but it is possible to completely ignore your pool for a long time if you take the right steps. In the spring you will have to do a little work to get it back into shape for swimming season, but if you properly winterize your pool, you can keep the work to a minimum. Winterizing your also protects it from colder weather. While we don’t get much snow here in Georgia, especially in the Atlanta area, we do get some pretty cold temperatures. And in the northern parts of the state, as you get up into the mountains, snow can be a significant factor over the winter. The cold weather can do a number on your pool, and if it freezes over, your whole pool system could be in danger if it wasn’t adequately prepared. 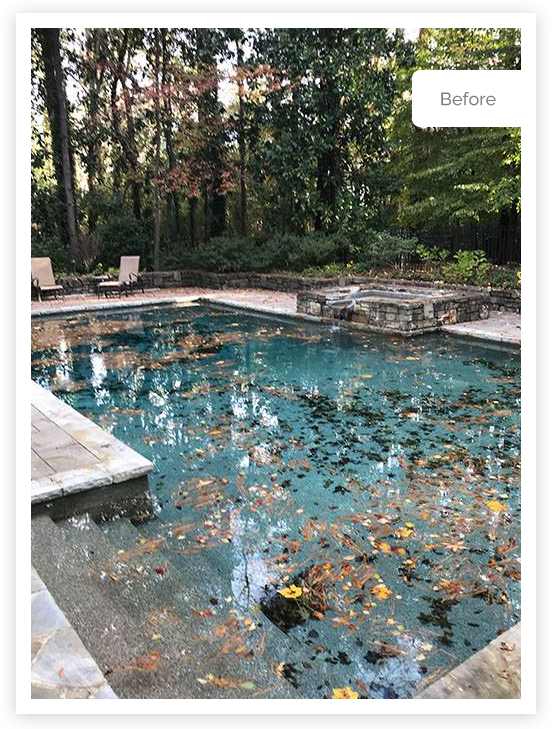 Winterizing your pool also keeps debris from autumn leaves and winter storms out of your pool. That saves you time and labor when it comes time to reopen your pool in the spring. Winterizing your pool can be a matter of safety. Pool covers are split into two main categories: winter pool covers and safety pool covers. Standard winter pool covers just float on top of the water like a large tarp. They can keep out lightweight debris. But if someone happens to fall into the pool, a winter cover can actually be a hazard, entrapping the victim and making it hard for them to escape the water. If you use a winter pool cover is it crucial that you keep your pool well secured, ideally with a locked gate. Winter pool covers come in a few different materials and thicknesses, but most can be classified as either solid, mesh, or a combination. The advantage of a solid pool cover is that it can keep out even small debris. It also blocks sunlight, preventing algae growth. It can make your spring opening much more manageable. However, you will need a cover pump to remove rain and snowmelt. If rain or snowmelt accumulates on a winter cover, the cover can sink into the pool, taking all the accumulated debris with it. A mesh pool cover avoids the problem of accumulating rain or snow, but it has other disadvantages. Some small debris may get through the mesh, and sunlight can still reach your pool, giving algae and chance to take hold. 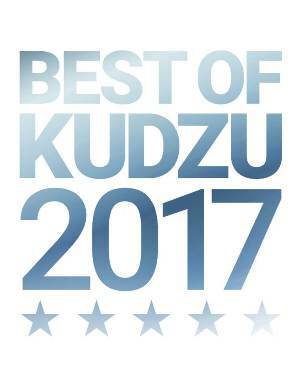 Most pool covers are simply draped over the pool and held in place by water tubes or other weights that are placed around the edge of the pool deck. Safety covers can support a lot of weight, including the weight of an animal or person. They can protect your family and pets from an accidental fall into the pool and can also keep out heavy debris like tree limbs or snow. Similar to winter pool covers, they come in solid, mesh, and hybrid styles. Because a safety pool cover is secured so tightly over a pool, using a solid safety pool cover will really keep out just about anything. Protecting your pool from sunlight and almost any debris will make opening your pool in the spring much easier. Of course, a solid safety pool cover will accumulate rain and snow, so a cover pump is necessary. Since it can support heavy debris, if a large branch or other heavy item falls on it, it will be necessary to remove the item to avoid a buildup of large debris. Installing a safety pool cover is a more complicated process than a regular winter pool cover. What makes a safety pool cover safe is the extreme tension applied to the cover, which makes it almost like a giant trampoline capable of holding quite a bit of weight. To achieve the necessary tension, you will first have to drills holes into the pool deck all the way around the pool to hold anchors. Once the anchors are screwed into the holes, the safety cover is laid out and attached to the anchors with a series of heavy straps and springs. Your cover will come with some special tools to strap everything down with the necessary tension. Once the cover is on, it will hold tight. It creates a more tidy look than a regular winter pool cover and is much safer. Before you close up your pool and walk away for a few months, you want to make sure it is prepared to stay relatively clean and problem-free. Here in the warmer South, we don’t often worry about a hard freeze. That makes preparing your pool a little bit easier. But the steps are almost exactly the same as they would be for pools farther north. The main difference is that you don’t have to blow out the pipes since there is little to no chance that the water in them will freeze solid. Balance the water and shock the pool. You basically want to get your water as clean and healthy as possible. Clean the pool really well. Skim, vacuum, and brush the pool bottom and sides. Run the filter for 24 hours for a few days. You want your water to be as crystal clear as possible when you close up your pool. Give it one more skimming just before you put the cover on. Lower the water level in the pool 12”-18” for mesh covers or 3”-6” for solid covers. If you have a DE or sand filter, you can cover the skimmers and use your main drain to drain to waste. If you have a cartridge filter or have no main drain, use a submersible pump or a self-priming pump on the deck to lower the water level. Drain your pool equipment. Pumps, filters, heaters, and chlorinators should all have drain plugs that can be opened to drain them completely. If you have a DE or cartridge filter, remove the filter grid or cartridge for cleaning after all the water has drained out. Keep the plugs open just in case some water leaks into the system over the winter. Add winterizing chemicals. You will need to add algaecide and pool shock, but remember never to add algaecide and chlorine-based pool shock at the same time. Non-chlorine shock is fine. Walk around the pool as you pour the chemicals in to get the best distribution. Then set up a floater with some chlorine tablets to release throughout the winter months. For a vinyl pool, use non-chlorine winterizing tablets to avoid color bleaching or damage to the vinyl liner. To make sure the floater doesn’t get stuck in a corner or on a step, use some rope or twine to tie it down in the center of the deep end. Cover the pool. Safety pool covers are best for both safety and the ability to keep out almost all debris. If you use a solid cover, either a safety cover or a regular winter cover, install a cover pump to remove accumulated rainwater or snowmelt. If you need help winterizing your pool, or you have any questions about how to do it yourself, contact The Pool Butler. We’re happy to help. And let us know when you’re ready to open up your pool again in the spring. With a little help from The Pool Butler, you can have your pool ready for swimming in no time!